IIS Manager supports the creation of a self-signed certificate which is sufficient for development purposes. The server configuration provides a‘Server Certificates’ option as below, in the Actions menu there is a ‘Create Self-Signed Certificate…’ item. There’s not much to the certificate creation process, enter a friendly name for the certificate. In my case I lacked imagination and went with ‘TestCertficateForWIF’. The certificate is created in the machine certificate store so running certmgr.msc doesn’t help as it opens the user store. Instead I ran the mmc.exe directly and added the certificate manager snap-in explicitly, when asked to choose a store I went with the local machine store. Looking in the Personal | Certificates node reveals the newly created certificate. Setting up an HTTPS binding for the Default Web Site is now possible. 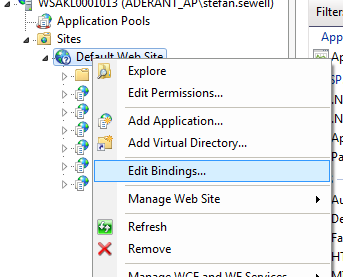 Select the site in IIS manager and then choose to Edit Bindings… from the context menu. The dialog allows you to add a new HTTPS binding, you just select the certificate you want to use as part of the encryption process. I next ran through the various steps in the walkthrough but when I tried the run the completed sample I got a KeySet error. The certificate name for the DemoSTS web.config only requires CN=, not two. 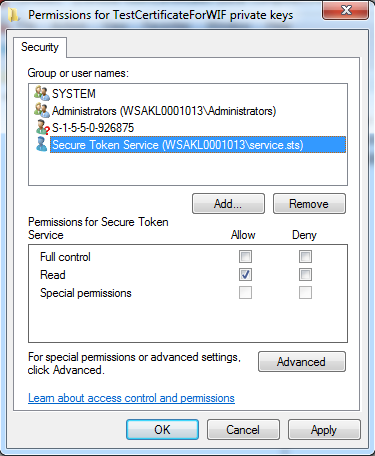 As we are using Windows authentication the console client does not need to pass credentials explicitly. When I set the credentials manually to a local test account I would see my domain account as the name in the returned claim. A quick search suggested that the AppPool account my services were running as did not have access to the private key of the certificate. OK, back into the machine certificate store and ‘Manage Private Keys…’ for the certificate. The web applications for the services were mapped to the ApplicationPoolIdentity (I’m running IIS7.5) so I tried adding the read right to the ‘IIS AppPool\DefaultAppPool’ account. This didn’t seem to help so I resorted to creating a specific service account and assigning it the read permission for the certificate. 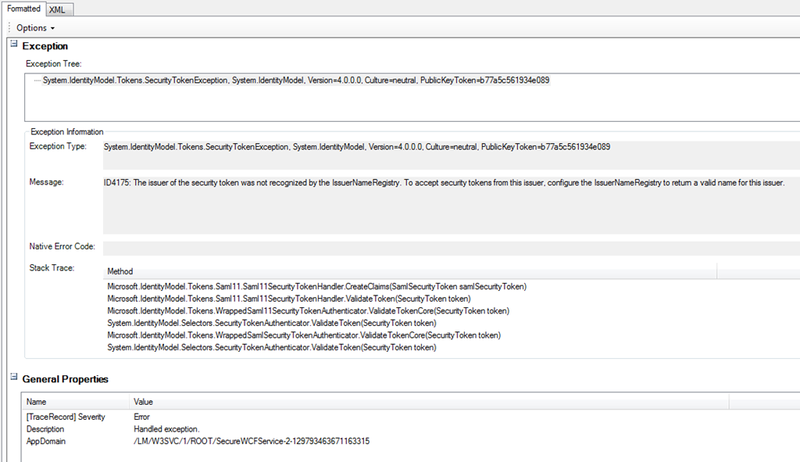 ‘The issuer of the security token was not recognized by the IssuerNameRegistry…’, that looked familiar so back to the web.config. 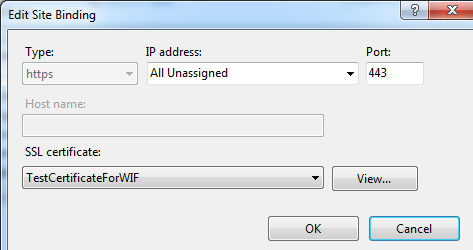 The thumbprint provided by PowerShell did not match my web.config so I updated the config.